It was the summer of 1972 when this writer was watching the Olympic boxing from Munich, Germany. Who would know that the USA team would only win a total of 4 medal’s one being a Gold and three Bronze medals? The one boxer on this team I always wanted to talk to was a Bronze medal winner Jesse Valdez out of Houston, TX. I started writing ten years ago and during that time I tried making contact with him but never was able to. Finally a week or so ago I saw an article by Rick Wright a Albuquerque Journal Staff Writer in New Mexico entitled “Boxing star Valdez still counting his blessings”. I was able to contact him and he gave me Jesse’s phone number and I took it from there. “The Lord gave me a gift,” said Valdez. His first coach was Charles Cord. There was one Gold medal winner on the 1972 team and it was “Sugar” Ray Seales from the Tacoma Boy’s Club that Joe Clough was coach. Seales would go into the professional ranks and end up with a 57-8-3 record with 34 knockouts. Also on the team gaining a Bronze medal was future two-time world light heavyweight champion Marvin Johnson, 43-6 (35).I contacted him and he said “why would you want to do a story on me?” I said “you were an Olympian and a two-time world champion”. He agreed to do a story. I love it when they are as humble as Marvin was. Another Bronze medal winner was Ricardo Carreras, of NY, representing the Air Force. After failing to make the 1976 Olympic teamhe turned professional in 1978 and went 2-0 (2). Three other team members of the eleven turned professional who were Duane Bobick, of the Navy, 48-4 (42) who I did a story on, Reggie Jones, 16-9-1 (8), of the Marines, Louis Self, 3-2 (2), of the Air Force and Davey Lee Armstrong, 24-3 (6) who was also a team member of the 1976 team that I did a story on him and teammates. Not turning professional were Raymond Russell, of the Marines, Louis Busceme, Louis Self of the Air Force and Tim Dement. “I love Jesse Valdez,” said Dement. Getting back to the other boxer representing the Air Force was Valdez who was the one boxer that stood out to this writer. My two favorite Olympians of all time were him and Chuck Walker from the 1976 team. Walker said of Valdez: I was one of those glued to the TV in 1972 watching boxing in the Olympics at Munich. Everybody knows Jesse was THE guy. He was the darling that year. I was 14 and just started boxing. He was one of my early heroes. Never noted at all for power but could that guy box, very slick, clever and effective. I believe he won the Bronze but should have won the Gold. I got to know Jesse well when he was the assistant coach at the 1975 Pan Am Games in Mexico City. We (team) trained in Durango, Colorado for several weeks, then got outfitted in Dallas and then onto MC. Jesse was a great pal and coach. He related well with the guys since he was more our age. I remember one time we were riding a taxi to the coliseum for the fights. I was fighting and Michael Dokes was fighting that night. Jesse was trying to find a radio station in English and finally happened on a song by Barbara Streisand. Dokes acted like that was pure anathema and went for the dial. Jesse slapped his hand away and said “Look man….we finally found something in English. Let it be. You’re not going to find any soul music in this city. Dokes said “I don’t know what’s worse….no music at all or Barbara Streisand!! !” Jesse and I used to walk around the Pan Am village together just out of boredom. We went to a few musical acts just outside the pavilion on the grounds. Often we had lunch together in the big cafeteria. Jesse was the one that took me to the USA medical building in the village when I got my lip split by Clinton Jackson in a freak accident in sparring. He looked out for us because he had been there and knew what it was like. He knew it was a tough business and he tried to make it less so. Valdez was also instrumental in calming what could have been a horrible situation when Tommy Sullivan won 100 bucks from Michael Dokes betting on pinball in the game room. Tempers flared and the two almost went together for real, but Jesse talked them out of it. Later that night 100 bucks came up missing from Tommy’s locker. Jesse, along with “Sugar” Ray suggested to the other fighters that we all put in a few bucks to get Tommy paid back. And then again the situation was controlled. I haven’t talked to Jesse in probably 35 years but have thought of him often and I’m glad to hear he’s doing well. If you talk to him give him my best and tell him I’ve had Burton Gilliam (from Dallas, TX) in several of my movies. Burton and Jesse fought several times back in the amateurs. Valdez said he had about 200 fights but never kept track of his record. It was in 1964 that the then 16 year old Houston native won the National AAU welterweight championship upsetting Olympic Bronze medalist Quincy Daniels of the 1960 Olympics. Valdez would qualify for the 1964 Olympic team as an alternate. In that same year he toured as a member of the US team in Africa. In 1967 Valdez won a Bronze medal at the Pan-American Games and was also the Golden Gloves champion. In 1970 he won the National AAU light middleweight title. In 1972 he won the Golden Gloves again and qualified for the US national team by defeating future world light heavyweight champion Eddie Mustafa Muhammad. “He cold cocked me and dropped me to a knee in the first round. I would return the favor in either the first or second round,” said Valdez. At the Olympics in 1972 Valdez defeated KolmanKalipe (Togo) 5-0, Carlos Burga (Peru) 4-1 which I thought was a tougher fight than with the Cuban but Valdez disagreed, David Jackson (Uganda) 4-1, Anatoly Khohlov (Soviet Union) 5-0, before losing in the semi-finals to Emilio Correa (Cuba) 3-2. This writer thought Valdez won without any doubt.Correra also won the 1971 Pan-American Games and participated in the 1976 Olympics. Valdez was in the Air Force never turning professional but even fought until 1980 at age 32 as an amateur. Junior Robles had him box on an amateur show against a Marine who outweighed Valdez by 40 pounds. “When I saw how big he was I moved and boxed him,” said Valdez. Robles also had him compete for the CA state amateur title in Sacramento where Valdez came out victorious. “I heard about him before I met him. He was like a legend. Everybody talked about Jesse. In 1967 or 1968 I saw him fight Joe Cokes, brother of world champion Curtis Cokes whom he out boxed.He was a gentleman, smart and a classy fighter. I was in the Air Force five years and knew him for about three years. Jesse touched a lot of boxers lives in a very positive way. He is a good friend, mentor and was an inspiration to me. I was proud to be his teammate. When he boxed he was sweet, hard to hit and he could punch…..hard. Jesse coached all the 1972 USAF boxing team in the National AAU,” said Nick Wells. Valdez was asked to go to Poland on the USA team by Robles whose father had a gym that Valdez was helping with the kids. “The Holy Spirit said why do you need to go. Also veteran USA team official Bob Surkant who was a father figure to me advised me not to go. So I told Robles I wasn’t making the trip. I almost fought Robles at the 1964 Olympic Trials,” said Valdez. Other boxers who claimed to be asked but didn’t make the trip were Jimmy Clark, Marvis Frazier, Bobby Czyz, Robert Hines and Davey Armstrong. The plane went down in Warsaw, Poland, killing all 87 aboard which included Robles. “My wife Jackie and I got down on our knees and prayed thanking God that I didn’t go. My whole life changed after that, my faith became my way of living,” said Valdez When he told me they were living in San Diego I told him we had a Calvary Chapelchurch there (Harvest Christian Fellowship) where Mike MacIntoshwas the pastor. Valdez couldn’t believe it for he attended that same church. Pastor Chuck Smith was the founder of Calvary Chapel. I’ve attended three of their churches on a week-end in 1989 after starting in Philadelphia. He and his wife Jackie (originally from Buffalo, NY) now attend a Calvary Chapel church in Albuquerque where Skip Heitzig is the pastor. They have two sons James (42) and Jeremy (40). Valdez told me “in 1972 I would spar with 156 pound team member Reggie Jones and I felt he stayed that heavy to avoid meeting me in the Olympic trials,” said Valdez.He said he worked with the Spinks brothers in 1976 and almost had to bring them home. After leaving the Air Force, Valdez became a TV cameraman, first in Houston and then to San Diego. I told him I had notes that in 1974 he worked on the prison siege at the Huntsville, TX, State Prison. “I was sent to Huntsville where 5 prisoners were holding 5 guards as hostages,with (now well-known writer) Cal Thomas who was the reporter,” said Valdez. In 1976 Valdez working with the Spinks brothers and almost had to take them home. In 1979 I was in Philadelphia at the Joe Frazier Gym where “Sugar” Ray Leonard, Marvin Stinson (1976 Olympic Alternate) and Leonard’s cousin O’Dell would be fighting in Philadelphia. The name Valdez came up and one of them informed me he was the one who started the bowing to the four corners prior to his fight. “I think I saluted but Correa did bow after that to the four corners. I would also go to my opponent’s corner after the fight before then returning to my corner,” said Valdez. “Jesse Valdez, David Martinez and Mark Tessman were (boxers) who I wanted to be like,” said Termite Watkins. I got an email from him due to contacting the Texan boxers I had articles with and all Christians. 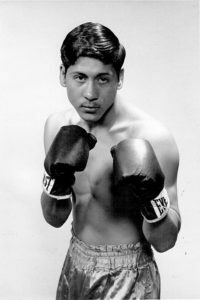 Termite was 61-5-2 (42), and from Houston who fought for the WBC super lightweight title. He has a book called “Termite” about his experiences in Iraq as a pest control exterminator which is well worth reading. He’s a great friend and one of the most genuine and humble boxers I ever met. I’m honored to call him my friend today. We keep in touch on the phone. He may be the greatest amateur fighter I ever saw. Valdez was kind enough to answer some questions. KEN HISSNER: The first time I saw you was in the 1972 Olympics and was immediately impressed with your style of boxing. Was your coach Charles Cord responsible for that? JESSE VALDEZ: In the long run I would say yes. I had him as my coach at a younger age. KEN HISSNER: You winning the National AAU championship at 16 in 1964 defeating Quincey Daniels who was on the 1960 team did that qualify you as an alternate for that Olympic team? JESSE VALDEZ: I lost to Maurice Trilot of the Marines and was an alternate. KEN HISSNER: Did you get involved with making the 1968 Olympic team? JESSE VALDEZ: I lost to Armando Muniz in the finals. KEN HISSNER: What period of time were you in the Air Force? KEN HISSNER: In 1972 you defeated Eddie Gregory (Eddie Mustafa Muhammad later) to qualify for the Olympic team. Was defeating him and Daniels two of your biggest wins prior to going to the Olympics? JESSE VALDEZ: If I win I win but never think of who I fought. KEN HISSNER: Were you still pretty active from 1972 to 1980 between your coaching at the 1975 Pan Am Games and still having some fights? JESSE VALDEZ: I was an assistant at the 1975 Pan Am Games. KEN HISSNER: Do you still stay in touch with any of your 1972 team members or have any re-unions? JESSE VALDEZ: I don’t really except “Sugar” Ray Seales. KEN HISSNER: Getting ripped off in the 1972 Olympics against the Cuban was that a deciding factor in not turning professional? JESSE VALDEZ: I had two offers. One was to stay in Air Force as the boxing coach and from Bill Daniels owner of the Denver Rockets. KEN HISSNER: How did the terrorist attack at the Olympics in Munich affect you and your teammates? JESSE VALDEZ: We heard the gunfire. It was quite alarming. KEN HISSNER: Not going to Poland in 1980 when their plane went down killing all aboard did that end your boxing career? JESSE VALDEZ: It totally did. I was 35 at the time and figured at that age I was too old. Junior Robles convinced me to go but I changed my mind. He was among those killed on the airplane. KEN HISSNER: I know you go back to Houston for some of the Golden Gloves tourneys. Are you completely out of training boxers now? JESSE VALDEZ: Unless you’ve been in the ring it is hard to teach someone to box. KEN HISSNER: I want to thank you for taking the time to answer questions and I have to tell you it is so rewarding to finally catch up to you. JESSE VALDEZ: It was nice going back in time with you.